Large wooden high gloss humidor, can hold up to 100 cigars. A subtle lattice inlay adds visual interest to this classic design. Opens and closes smoothly on hidden quadrant hinges. This elegant cigar holder includes one large rectangle humidifier, a glass hygrometer with brass frame and is equipped with the proprietary SureSeal technology to insure proper lid seal on closure. It includes a Spanish cedar tray with divider and 2 dividers at bottom, its interior is lined with premium kiln dried Spanish cedar. 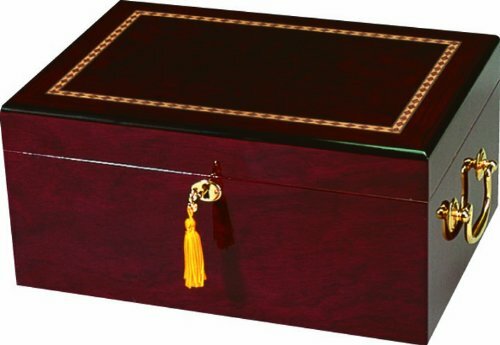 This stylish cigar humidor features gold plated lock and key with tassel as well as engravable brass nameplate.